Is home study for you? 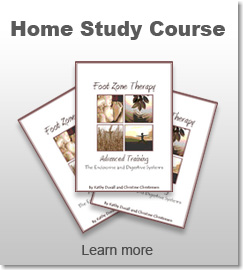 Due to multiple requests from potential Foot Zone Therapists across the nation, the Academy introduced the Home Study Course in 2012. Numerous students have completed the Home Study course and provided valuable input on how we could make it even more effective. We have listened to feedback from students and have made improvements to the curriculum. We feel like we have created one of the best programs for learning Foot Zone Therapy in the nation. I am lucky to have had so much support and help from family, who took care of my little one so I could study. Kathy was a wonderful teacher, and so full of knowledge and excitement that was infectious. Since I had a very limited amount of time to accomplish the coursework, Kathy was instrumental in helping me to reach the 80 practice zone requirement. I am also grateful to family and friends who were willing to let me practice on them. The material is explained clearly, and in a way that makes good sense. I made flash cards from the review books, which I carried around with me everywhere. They saved my life in the month I had available to do the classes. If it is difficult for you to make the four in-person training classes held by an instructor. If you have family requirements that make in person training difficult. It is too expensive for travel and lodging to make the four in-person training classes. The class schedule doesn't fit your life situation right now. If you want to extend or expedite the time frame for completing the curriculum. How is home study different than the in person classes? Your study materials will be mailed to you – you will learn on your own schedule. You'll study at your pace and location. You will have one trip versus five. You complete your test books and simply mail them to your instructor for grading. When your instructor feels you are ready for testing, you will travel to your instructor's location for a two to three day hands-on intensive training. Your assignments and practice zones will be the same as in-class students. You will have personal phone consultations with your instructor for any questions or clarifications. How is home study the same as the in person classes? You apply to the AFZT through email, phone or a combination or the two. You choose your AFZT trainer. You'll be taught by an Academy certified instructor. You'll do the same assignments. Tuition is the same ... $3000 including the final exam and all study materials. There will be a final exam. (3-4 hours to earn your certification). Once you successfully complete the class you'll be listed as a Foot Zone Therapist on the Academy web site - which will allow people to contact you to schedule appointments. Home-study students are invited to become instructors. All students are invited to participate in our monthly conference call. When you complete your curriculum you will be able to participate in the Academy’s continuing education programs. All four text books created by the Academy. In-depth study guide to accompany each section of the text books. Complete educational books and support! This combo package gives you all the tools to learn the zone from home and work intensively for 3 days with an instructor to finalize your training. The home study kit includes: Intro book, Compilation book with the 3 advanced books, DVD of the Zone, Flip Chart, Poster and Study Guide (including review books). Why put it off? Place your order and get started today! We hope the above information gives you a clear picture of the AFZT Home Study Course, and that there is great flexibility in the program. We encourage our students to complete the program in as brief a time frame as possible for increased retention. If you feel this is a fit for you, call us and we'll answer any questions you have. We see the Home Study program as the vehicle that will create opportunities for practitioners and the profession to support health conscious people in obtaining better health. If you have any further questions please contact Christine or Kathy today!